Are you in the mood for something spicy? Our Argentinian chorizo sausage, seasoned with paprika, garlic and several other special spices, will taste delicious no matter how you use it. Fire up the grill, stick it in a stir fry or use it as the base for a sensational sandwich. Try our chorizo from Argentina today. Ingredients: Pork, Less than 2% of the following: Water, Salt, Paprika, Sugar, Spices, Potassium Chloride, Dehydrated Garlic, Extractives of Paprika, Natural Flavors. Trying foods from other countries opens up your taste buds to a world of delight. In the past, you may have enjoyed curry from India, sushi from Japan and tacos from Mexico. Now it’s time to explore South America. 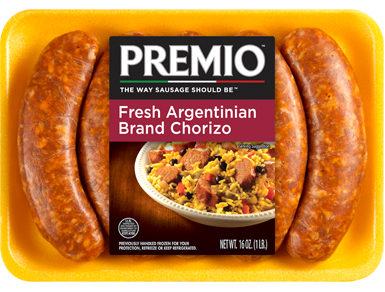 Get a taste of the continent with Argentinian chorizo sausage, available from Premio Foods. Our delicious chorizo from Argentina has a spicy bite that will knock your socks off. Each morsel includes a dash of paprika, a bit of garlic and a host of other spices added to give this sausage the authentic taste of Argentina, a country known for producing some of the world’s best beef cattle. The Argentinian terrain includes the beautiful Andes mountains as well as the Pampas grassland. Sausage isn’t its only export, though. Did you know that Argentina gave us the Tango, a dance known for its passion and rhythm? It also produced two of the world’s best soccer players, Diego Maradona and Lionel Messi. When you enjoy Argentinian chorizo, think of all this country has done and all that it could become in the future. That’s a lot of potential packed into each tasty bite. You can use chorizo in much the same way as you would any sausage. It works well as part of your breakfast, whether you fry up a few sausages as a side dish for your eggs or make them the focus of the meal. You may also slice Argentinian chorizo for a breakfast egg casserole. No matter how you prefer our chorizo, you can feel good about serving it to your family. Each serving includes a hefty dose of protein at 14 grams, and it’s relatively low in calories. It’s the type of food growing kids can chow down on to get the nutrition they need. Premio Foods has been making sausage for more than 40 years. We never use fillers in our sausages, so you get all good stuff when you order from us. We also offer a variety of sausage choices, from chicken to pork, breakfast links to patties. We can only thrive when we keep our customers happy by supplying the sausage they want, and so we listen to your input and suggestions to better serve you. We sell more than 40 varieties of sausage — enough to fill up any freezer. We also offer money-saving coupons for our customers, another way we like to say thank you for choosing our products. We owe all of our success to the people who buy our products again and again, and we are grateful for that repeat business. We invite you to try some of our chorizo from Argentina today. We know you will enjoy it.